I had two of these up, and was planning on trimming the rest of them as a fast leaders/enders, when The Accident happened. I thought they might need sashing, but now I think I like the secondary pinwheels. Maybe. When I finish all of them, I'll see if it looks too busy. However, I never realized how much your index finger holds the ruler when trimming, until I was squaring up the third pinwheel. I powered through that one, but I'm going to have to go buy a gripper or something, because I have nothing but the Steelers quilt pre-cut. This, folks, is why you should not rotary-cut your finger have lots of projects pre-cut and waiting for you. 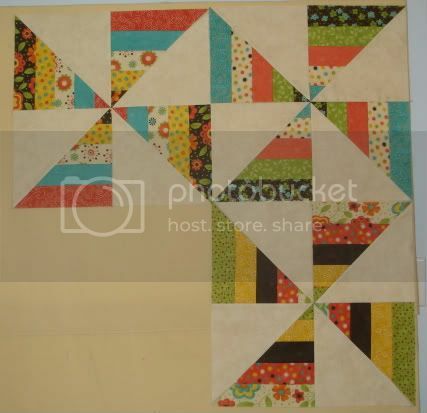 Check out more design walls on Patchwork Times!